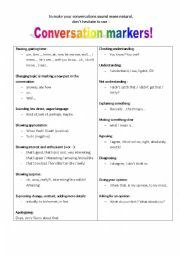 I used this sheet to help my students write and perform a dialog. These expressions helped their dialogs sound more natural. 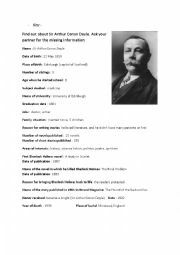 This activity has a Student A and Student B sheet with different information about Conan Doyle´s biography. Students must ask each other questions to fill in the gaps. Key is provided on the first page. 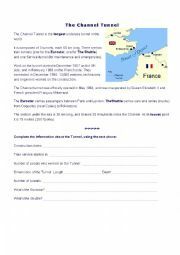 This is a text about the construction and characteristics of the Channel Tunnel between France and England. Comprehension questions are below the text. I made if for a class of 4e so that they can learn some facts, but I think it can be used with younger students. 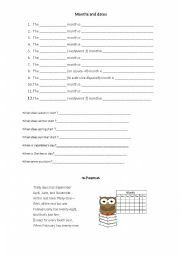 This is a worksheet for elementary students to practice ordinal numbers and months, as well as saying the dates with the correct prepositions. It ends with the poem "30 days has september..." that students can practice saying and learn by heart. This is a list of questions to use with elementary students as a warmer or closing activity, which allows them to practice short or longer answers with familiar questions. This is a worksheet to go with a video extract from the film "Meet the parents", in which the main character is submitted to a lie detector test from his prospective father in law. This can lead to a discussion about the effectiveness of such tests, and how we can tell that a person is lying. I use this presentation to go with a lesson on the comparative and superlative of short and long adjectives, as well as irregular ones. In the first part we compare the height of 4 world leaders (Merkel, Hollande, Cameron and Obama), and in the second part how good or bad some food is.